The Radical Sizzle heats things up by pairing a symmetrical core with the Ai-38 coverstock. This hot combination bring length and powerful down-lane motion. 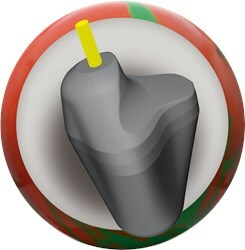 This is a great ball option for league bowlers or anyone looking for a performance ball at a great price. Similar Balls: Same Hook Potential, Lane Conditions & Coverstock as the Radical Sizzle. 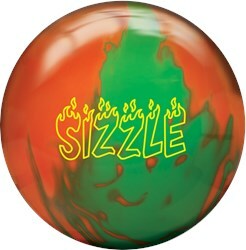 I drilled the Radical Sizzle to be the ball that will destroy pins on any given league night, and wow, does it perform! I drilled mine 60 x 4 7/8" x 20. This ball is an absolute house shot killer, it clears the front part of the lane and explodes on the back, continuing through the pins with great hitting power. When other symmetric core balls lose their look and start leaving corner pins, the Sizzle keeps carrying and allows you to use it in your favorite part of the lane longer. I shot 760 and 744 my first two league sets with it, and already can't wait for league this Thursday to use it again! This ball also takes to cover changes well, as I sanded mine with a 3000 pad and it allowed the ball to pick up a little quicker and smoother, which is what I like for tournament play. This is yet winner from Radical! Order yours from your local pro shop or online retailer today! Things are HEATING UP with Radical! I drilled my our Radical Sizzle 90 x 3 3/4" x 35, our normal "benchmark" layout. This ball was everything I wanted it to be. Its a clean benchmark type ball with more skid / flip tendencies. I could see this as a replacement for the Cyclops, especially if you give it a tiny amount of surface. If you knock the cover down with a used 4000 pad (lightly) it will spring to life, offering a few more boards hook, but still the awesome distance and recovery. Due to the time it takes to produce the Radical Sizzle ball it will ship in immediately. We cannot ship this ball outside the United States.